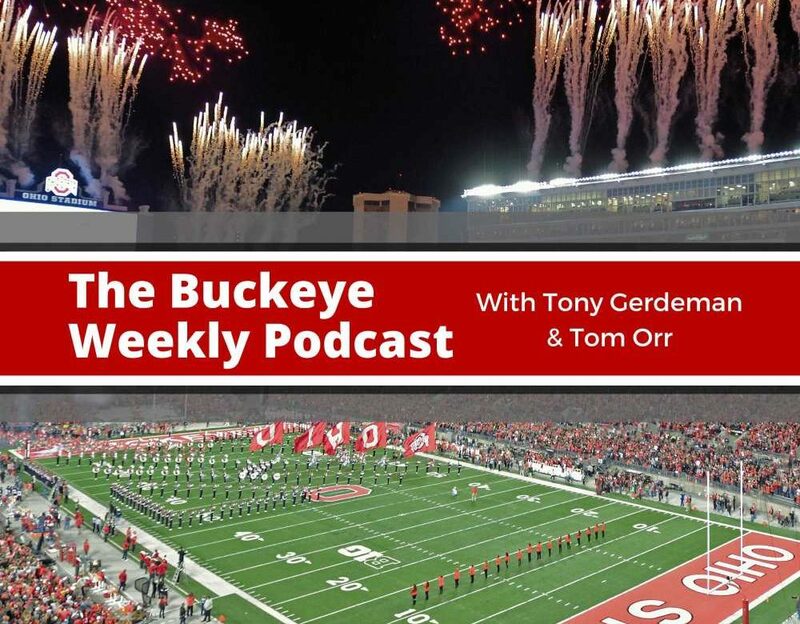 In this episode of the Buckeye Weekly podcast, Tony Gerdeman and Tom Orr discuss Ohio State’s remaining recruiting targets on the offensive line and measure the likelihood of each becoming a Buckeye. Transfer quarterbacks are also a topic of conversation. Who is out there for Ohio State? The fellas also talk about the departure of Keandre Jones, the trajectory of Terry McLaurin, and they begin their spring previews with a look at the Buckeye special teams. + Tips for beating the cold at home. + Remember the Boss Button? + How about that basketball game last night that we haven’t seen yet? + Rutgers offensive lineman Jonah Jackson has entered the transfer portal and will visit Ohio State. + Tony was impressed by Jonah Jackson after some intensive film review. + What is the likelihood of OSU’s final four offensive line targets ending up as Buckeyes? + Enokk Vimahi is more of a 2023 prospect and not a 2019 prospect. + Vimahi is not the priority that Doug Nester, Dawand Jones, and Jonah Jackson are. + Don’t fault Jonah Jackson for leaving Rutgers and wanting to go somewhere else and experience success. + Jackson is more of a sure thing than some high school kid. + Let’s talk about possible quarterback transfers. + Could Texas A&M’s Nick Starkel be a Buckeye? + Starkel could be the perfect guy. + It is going to be difficult to find the write formula for that fourth quarterback. + If you bring the wrong guy in, it could create more drama than will already be here. + There is a local kid out there who will be graduating this spring from a Power 5 team who has not played much and could be the perfect fit as Ohio State’s fourth quarterback. + It’s going to be difficult to convince a QB who wants to play that the Scout Team is just as good. + Ohio State needs to replace the scout team QB Kory Curtis as well. + Let’s talk Keandre Jones’ transfer to Maryland. + Did OSU miss on him as a recruit, or did they do him wrong by not playing him? + Keandre Jones was with the ones in the spring, but couldn’t hold on to a job. + Coaches are going to play the best guys. + Brendon White is proof that that’s not always the case, however. + Stop ruining Tony’s arguments please. + Don’t be surprised if Keandre Jones is a captain at Maryland this year. + Don’t get worked up if Jones ends up with 150 tackles this season. + Ohio State has to find a way to get Baron Browning on the field or find out for sure that he can’t play. + Where will Browning end up on the depth chart this year? + Terry McLaurin had a big week at the Senior Bowl. + Went from an undrafted guy to possibly a second or third-round pick. + How much credit should we give Brian Hartline? + Brian Hartline is already killing it as a recruiter. + The Buckeyes have the top four 2020 receivers interested. + Hartline is a future and present coaching star. + He is OSU’s go-to guy on the recruiting trail right now. + Enjoy Brian Hartline while he’s at Ohio State. + Look at what he did with Chris Olave. + Five-star CA WR Johnny Wilson probably noticed. + Ohio State stretching the nation looking for receivers. + Building a pipeline in Washington. + Let’s begin our spring previews with special teams. + Urban Meyer and Taver Johnson are gone, so there will be changes. + But probably not as many as people think. + Why change the Plan to Win when it works? + Will new special teams coordinator Matt Barnes bring an end to OSU’s punt return adventures? + Muffing punts is just the nature of the game. + Punters have also made catching the ball more difficult. 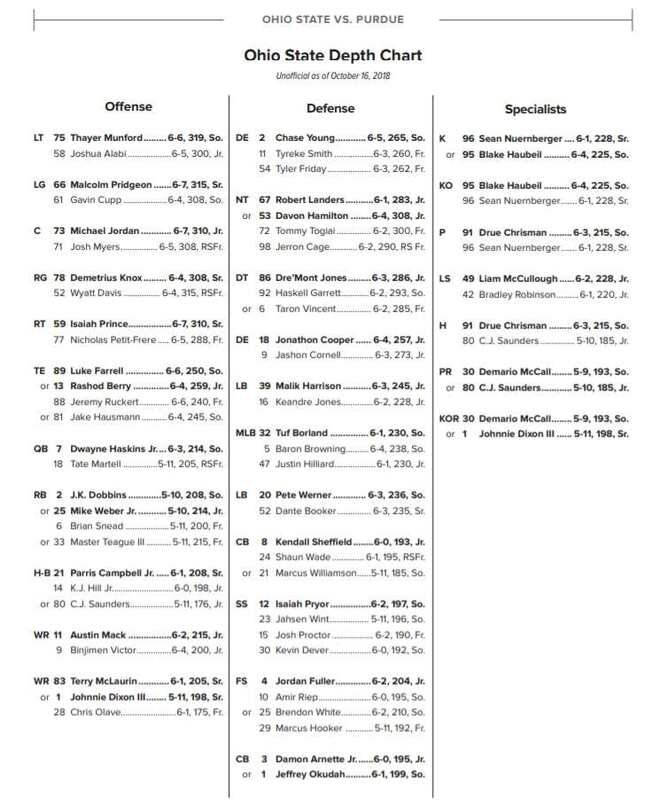 + What will the depth chart look like among the kick/punt returners? + Who is the next great gunner? + Will Ryan Day end Urban Meyer’s archaic rules about first contributing on special teams before playing on offense or defense? + The kicking specialists are back and they should be very, very good. + So why change the kickoff strategy now? + Ohio State should be more aggressive on returning opposing kickoffs. + Getting rid of kickoffs entirely. + Moving from kickoffs to a 4th-and-15 punting situation. + Sign us up, but 4th-and-15 is too close. + Is 4th-and-15 far enough away to discourage teams from doing it? + The fair catch rule hasn’t eliminated collisions because tacklers are still running full speed into blockers. + Ending kickoffs and going to a 4th-down option would make the game more entertaining. + It’s either make the game different or get rid of the game entirely, so give us different. + Tony asks Tom where Ryan Day ranks among the Big Ten East head coaches. + Tom thinks this may be the last year for Mark Dantonio. + Thanks for the ratings and reviews, your prizes will be shipped when the cold goes away. We ask that you do us a solid and rate and review us on iTunes so that more people can see us and hear us. Subscribing is cool too. As always, we’re on Google and you can download this show as well. We are now also on the TuneIn App and IHeartRadio as well. You can also subscribe to The-Ozone Radio Network on iTunes and have an Ohio State podcast delivered to you every time they drop. You can also always visit our Podcasts page here, which is tucked inside the Football tab in the menu at the top of this page.